Show off your retro love by opting for this amazing ‘50s pageboy look. Even though it features long and stylish side-swept bangs instead of short front fringes, the beautifully set locks with rolled up ends can give you a highly sophisticated appearance. It might seem to be similar with long bob hair cut with straight bangs. But have a look at the edge of the tresses and you will understand how the elongated hair has created a striking combination with the traditional pageboy hairstyle. A great mash up, indeed! 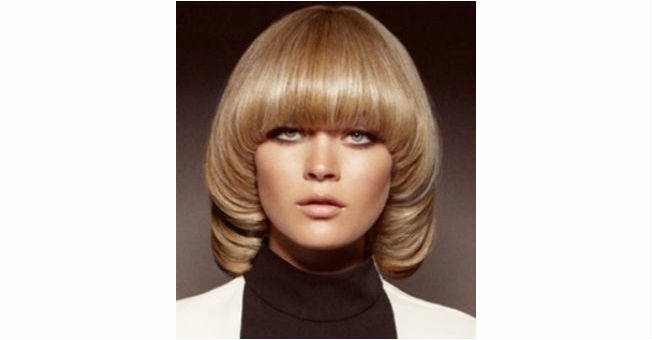 Here is a voluminous version of classic pageboy hair. From the perfectly rounded ends to the neatly curved shape of the hair, each and everything has made this style a remarkable choice for women with fine locks. It really looks splendid on blonde hair. If you have a round or oval face and a natural inclination to short hair, this cute pageboy hairstyle will suit you the most. Keeping the hair a bit messy and sticking to the light brown shade will make you look even more innocent. Just have a look at the cute Japanese girl in the following picture. Yes, pageboy can also give you a highly stylish as well as elegant appearance if you transform it a little bit. All you need to do is to replace your straight rounded fringes with curved side bangs. Oh, you’ve just discovered a sexier you, right? Who says that a pageboy hair cut is all about roundness? This dramatic hairstyle will show you how sharp geometrical outlines can also enhance the beauty of a pageboy cut. The arched line of hair over the forehead and the curved sidelocks over the cheekbones are enough to define it. Now, here is a sweet and cute Korean adaptation of pageboy hairstyle. As you can see, the fringes have reached below the eye brows, while rest of the hair has got a nice bowed shape in this hair cut. For increasing your simplicity through your look, keep the hair slightly untidy. Want to draw attention to your pageboy hairstyle by creating an illusion of a bob? Go for this smart hair cut and enjoy how people like your new look. ‘Neat’ and ‘trendy’ should be two most appropriate words for it. Isn’t it? Imagine a bunch of glossy hair with a beautiful pageboy cut. Does this excite you? Well, this particular hairstyle will offer you exactly what you wish to have. You can also spice up your look by keeping the edges of your hair razor-sharp. Finally, here is an absolutely gorgeous pageboy style on a super modish platinum hair. From the thick side-swept to the distinct side layers, this hairstyle has all those elements that you need for standing out from others.